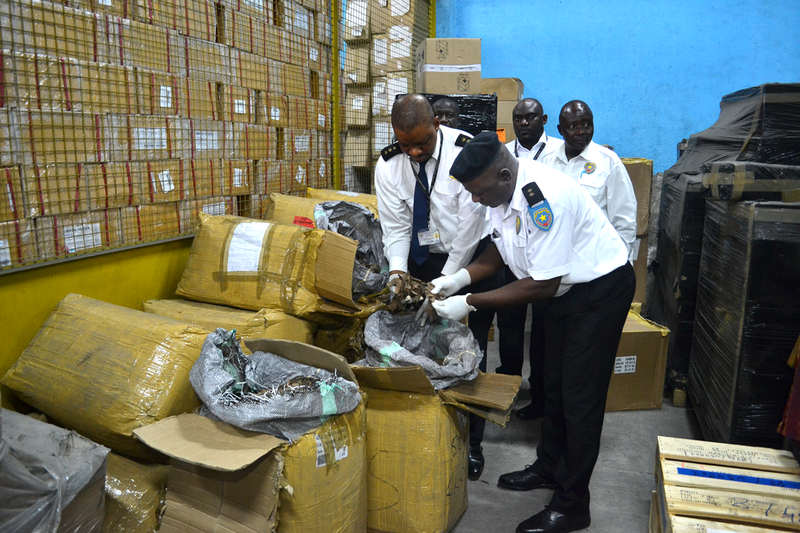 On 5 May 2014, nearly 750kg of pangolin scales, a CITES-protected species, were discovered by Customs officers in the Democratic Republic of the Congo during a routine check. This seizure illustrates the extent of the trafficking of pangolins: at a rate of 0.12kg of scales per average individual, the batch represented nearly 6,400 animals. In October 2014, the WCO launched a new project aimed at enhancing Customs’ capacity to counter wildlife trafficking by ensuring that all trade in wild plants and animals, and any products derived from them, is legal in terms of the implementing provisions of the Convention on International Trade in Endangered Species of Wild Fauna and Flora (CITES), as well as under any relevant national legislation. Named INAMA, a word which means ‘wild animals’ in the language of the Zambian Bemba tribe, the project is not the first wildlife-focused initiative undertaken by the WCO. In fact, the WCO has long been involved in efforts to combat the illegal wildlife trade by raising awareness among frontline Customs officers, organizing training to improve their targeting and identification capabilities, leading international enforcement operations, and developing practical training guidance. A previous project, named Project GAPIN, which ran from 2010 to 2013, focused, in particular, on the illegal trade in great apes – chimpanzees, gorillas, and bonobos – and the enhancement of Customs integrity in the area of CITES enforcement. Project INAMA follows on from GAPIN, but benefits from a wider funding framework, and focuses on enhancing the methodology and techniques used to enforce wildlife trade regulations in general. The project was boosted by the ‘WCO Declaration on the Illegal Wildlife Trade’ which was adopted by the WCO Council in June 2014, reinforcing the commitment of the global Customs community to fighting this type of crime, and listing the steps that will contribute to a stronger and more coordinated enforcement response. have at their disposal modern equipment, including the required hardware and software, to facilitate enforcement. 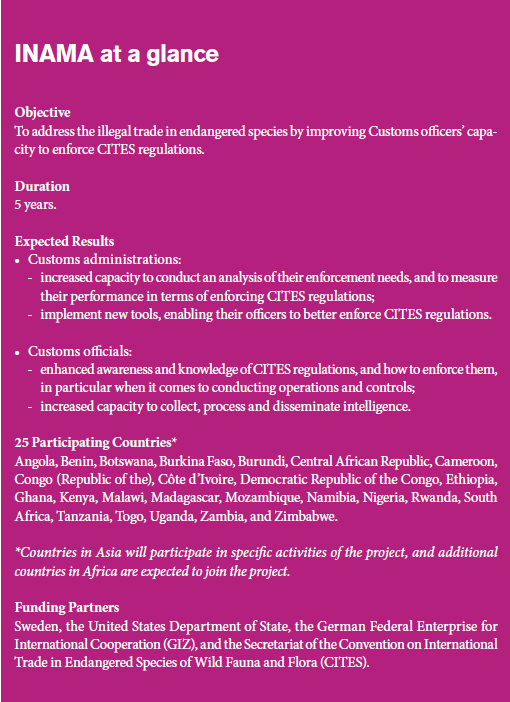 The project’s approach is to address the needs of Customs and their enforcement function, while providing specific information and tools that are directly related to ensuring compliance with the CITES Convention. Although some common needs were identified in the project’s planning phase, Customs services in Africa do not present a homogenous grouping, with their needs as diverse as the countries themselves. As a result, it was agreed that participants should assess their own capacity building needs at the national level. To enable them to do so, the WCO has developed an Institutional Assessment tool. It is based on the Diagnostic Framework, developed by the WCO, and is in line with the provisions of the Wildlife and Forest Crime Analytic Toolkit developed by the United Nations Office on Drugs and Crime (UNODC), with the support of the International Consortium on Combating Wildlife Crime (ICCWC), comprising the CITES Secretariat, INTERPOL, the UNODC, the WCO, and the World Bank. The tool will be presented to the project’s participants during two regional workshops, in Malawi and in the Republic of the Congo, under the guidance of experts. Participants will be asked to start evaluating their countries’ situation, and to self-assess their capacity building needs. This exercise will also enable the WCO to gather feedback from participants on the tool, and to revise it if necessary. On their return to their home Customs administrations, participants will have a few weeks to complete the assessment and send it to the WCO Secretariat, which will use their responses to plan future training activities. Building on the common needs identified during the planning phase, the project team decided to move ahead on certain capacity building activities related to risk management and intelligence analysis. The object is to improve Customs’ capacities in all the relevant phases of the intelligence cycle, namely the collection, evaluation, collation, analysis, dissemination and re-evaluation of data. Basic and advanced training on intelligence have been designed, and experts will periodically be made available to support enforcement teams. This component, which is at the heart of the project, aims to enhance the capacity of Customs administrations in conducting enforcement operations through the use of a wide range of techniques, such as the conducting of controlled deliveries. To do so, practical training will be delivered, and field manuals supporting the daily work of frontline officers will be developed. A draft version of the Institutional Assessment tool is now available, and has already been trialled at a regional workshop that took place in Malawi in September 2015. A one-week Basic Intelligence Analysis training session was held in Mozambique in April 2015, and in Kenya in July 2015. Participants, including Customs officers working in the field of risk management and intelligence analysis, were taught about the basic concepts of intelligence analysis, and were involved in case studies and practical exercises, while continuously being asked to provide feedback on the learning process. A workshop on ‘Controlled Deliveries of Illegally Traded Wildlife Products’ was held in Bangkok, Thailand, in January 2015, with participants from eight Asian and African countries in attendance. About 30 Customs officials and participants from other relevant institutions – for example, the police, and wildlife and environmental authorities – with the competency to conduct controlled deliveries, or likely to be called upon to provide support during such operations, shared their experiences and practices, and how they overcame any obstacles. The workshop also enabled participants to develop ties with each other, and to discuss closer cooperation and mutual assistance possibilities in the future, especially in the framework of two wildlife enforcement operations, namely Operation COBRA III and Operation FLYAWAY, which took place in May and June 2015 respectively.